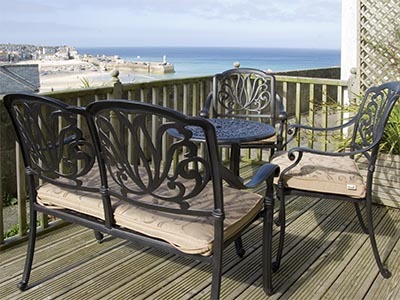 Accommodation at Poscader - your luxury self catering holiday cottage at St Ives, Cornwall. Poscader is a new modern apartment overlooking St Ives harbour with stunning sea views from within and outside from the private decking. You reach the apartment via Skidden Hill and just half a minute walk down the hill will take you to the sea front. 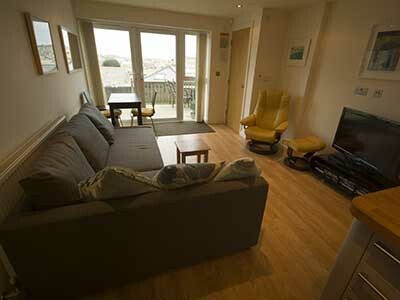 The holiday flat is open plan and built and equipped to a very high standard. From inside there are great views of the harbour and pier. 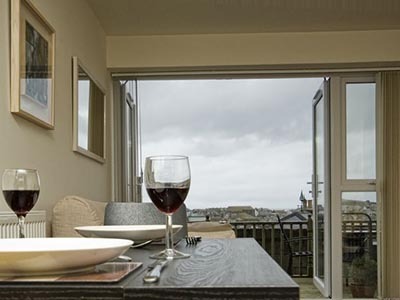 Outside there is a large enclosed decked terrace where you can enjoy al fresco dining and take in the wonderful panoramic views of the town, the harbour and right across St Ives bay to the Godrevy lighthouse and the North Cornwall coast. There is Wi-Fi broadband and the cosy central heating means you can enjoy Poscader in winter too. All bedding, sheets and towels are supplied. You will enter Poscader via the decked terrace which you access from part way down Skidden Hill. 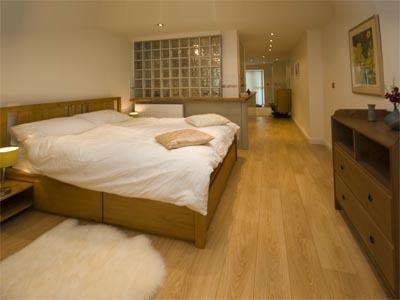 The furnishings are contemporary in style and there is wooden flooring. Furniture includes a 3-seater sofa with chaise longue which can be converted easily into a comfortable double bed. There is also a comfortable leather recliner with matching footstool. For your entertainment there is a 37 inch quality digital TV and MyView Box with integrated players and live TV pause. There is also a Blu-ray, DVD and media player along with an assortment of DVDs and Blu-ray discs plus a Bluetooth sound system. There is an extending dining table with two dining chairs plus an additional two stools along with a nest of two occasional tables. 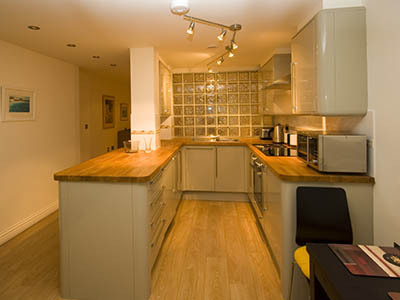 Poscader is fully equipped with cosy central heating and free Wi-Fi. The kitchen area contains modern gloss fronted kitchen units along with integrated appliances including an electric oven with a ceramic hob, a larder fridge, a dishwasher, a washing machine/ tumbler dryer and a microwave. A small freezer is located in a side room. The work surface and breakfast bar are solid wood. 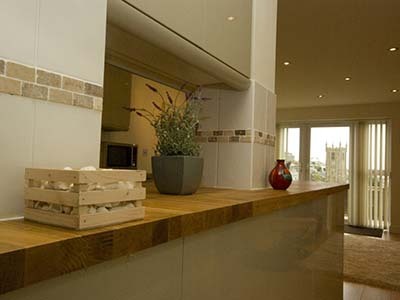 We have tried to make sure that all your needs are catered for and you will find a large collection of modern quality equipment, so if you just want to boil an egg or prepare a banquet dinner, you should find all that you require. The dining table and chairs are perfect for a cosy dinner for two or if you have extra guests or need more space it extends, and with matching stools you have dining for four. There is a large collection of modern crockery and utensils; and if you enjoy Cornish teas, there is even a bone china tea set. St Ives also boasts some fantastic restaurants and cafes; check out the guest book for some recommendataions from some of our guests. The bedroom has a comfortable King Size bed with storage underneath. The duvet and bed linen are of very high quality and the crisp cotton sheets will promise you a great night's sleep. There are bedside tables, a chest of draws and a full lenth wall mirror. There is a door to the ensuite shower room with large modern shower unit and a door to a walk-in wardrobe/dressing and storage area including a freezer unit. St Ives is one of the sunniest seaside resorts in the UK.